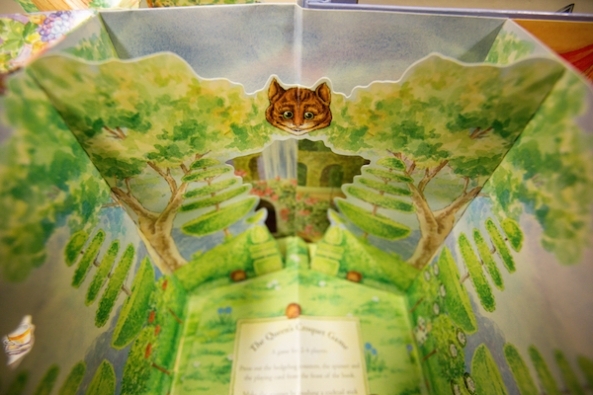 An illustration from Robert Sabuda’s edition of Alice’s Adventures in Wonderland, a pop-up book. A pop-up illustration from Nick Denchfield and Alex Vining, Alice’s Pop-Up Wonderland (2000). 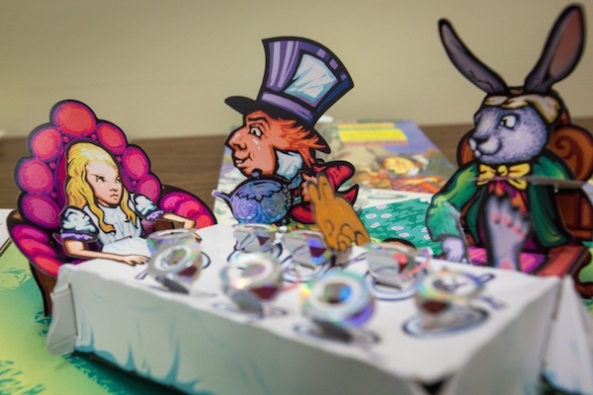 Emma McKean’s version of Alice in Wonderland (1943), a moveable book. 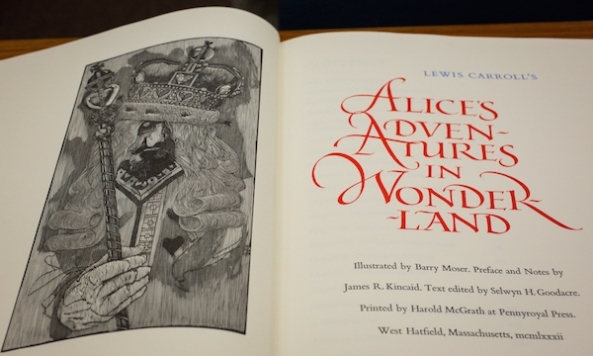 The title page from Barry Moser’s illustrated edition of Lewis Carroll’s Alice’s Adventures in Wonderland (1982), showing Moser’s imagination of the King of Hearts. A page from Georgie Gregg’s version of Alice’s Adventures in Wonderland done in Gregg shorthand. 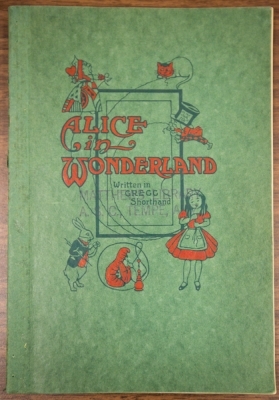 A very small version of Alice’s Adventures in Wonderland published by the Little Leather Library (1921). 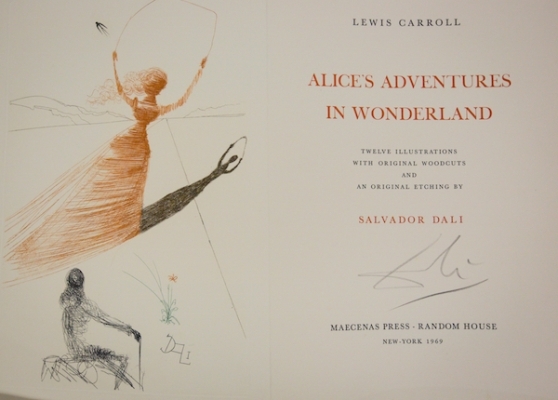 The title page for Salvador Dalí’s limited-edition illustration of Alice’s Adventures in Wonderland (1969). 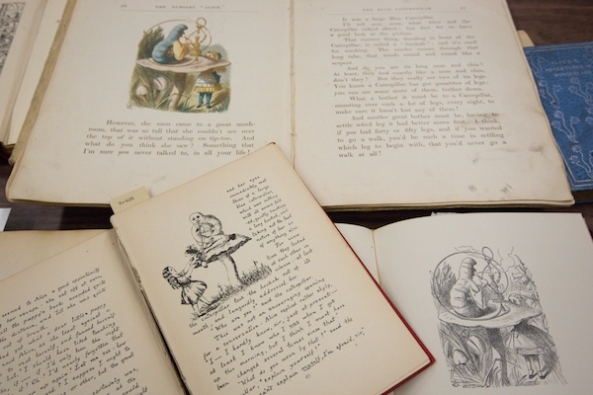 Three visions of the Caterpillar: a black-and-white image from John Tenniel, a Tenniel image colored by Emily Gertrude Thompson, and an illustration by Lewis Carroll himself in a facsimile of his original handwritten manuscript. 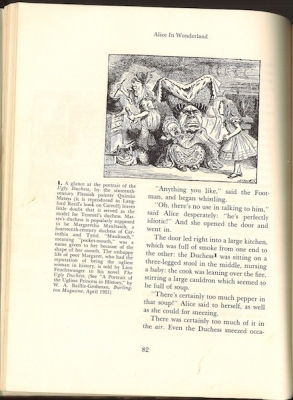 A page from The Annotated Alice: Alice’s Adventures in Wonderland & Through the Looking-Glass (1959), with annotations by Martin Gardner. 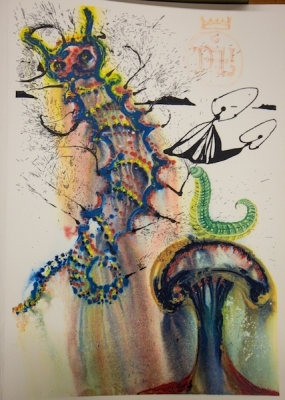 Dalí’s illustration of the Caterpillar. 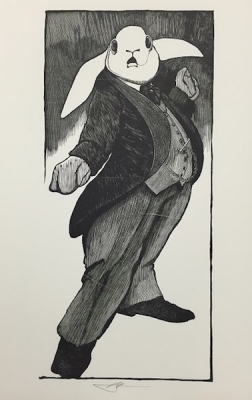 Moser’s illustration of the White Rabbit. Dalí’s illustration of the Mad Tea Party. The Mock Turtle, the Cheshire Cat, Tweedledum, the White Queen: Few books have given us as many memorable characters as Lewis Carroll’s Alice’s Adventures in Wonderland and Through the Looking Glass. Few books have seen their characters so often reimagined. That variety can be seen in a special exhibition assembled by Arizona State University to commemorate the book’s 150th anniversary. These include a Wonderland pop-up book by Nick Denchfield and Alex Vining from 2000, a version by Emma McKean from 1943 that features sliding panels with different illustrations, and an edition of Carroll’s text with woodcut illustrations by Barry Moser 1982. There’s a shorthand Alice. There’s a 3-by-4-inch Alice. Not to mention a set of Alice paintings by Salvador Dalí. But even if Tenniel makes for a daunting predecessor, Alice’s Adventures and Through the Looking Glass remain tempting for artists. In these books, words and pictures are almost equals. They have been so from the beginning: Carroll’s original manuscript included his own illustrations, one of which can be seen at ASU. More than most, the stories depend on images. (At one point, Carroll instructs readers: “If you don’t know what a Gryphon is, look at the picture.”) It can even be tough to say where illustration ends and text begins, as in the famous case of the “mouse’s tale,” where Carroll intended his words to wind down the page in a diminishing tail. John Risseeuw, an emeritus arts scholar at ASU who taught printmaking and the history of the book, points out that Carroll’s whimsy gives book artists a lot of latitude. Even more important, perhaps, Alice and Through the Looking Glass abound in artistic inspiration. “The story is so fantastic and surreal that it provides a lot of opportunity for imagination,” said Risseeuw. 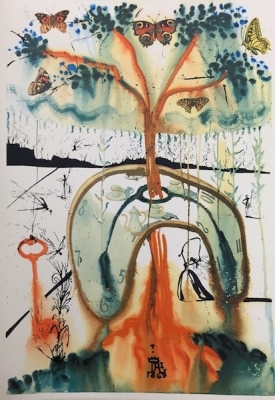 The ASU collections offer proof—from Dalí’s colorful caterpillar, stretching across the page like a cross between Rorschach blot and rainbow, to Moser’s black-and-white rabbit, dressed in an imposingly proper three-piece suit. Risseeuw noted how Moser’s use of negative space differs from Tenniel’s. Moser’s prints are also deliberately imperfect, filled with tiny cracks that came from his using unseasoned wood. He invites readers to fill in the gaps with a pen—an unconventional but somehow Alice-like suggestion. Carroll would have agreed. “Did you ever see such a thing as a drawing of a muchness?” the Dormouse asks Alice during their Mad Tea Party. If she had, it might be her own story—in all of its versions. *Photos courtesy of Arizona State University. Primary editor: Jia-Rui Cook. Secondary editor: Sarah Rothbard.